My name is Alessandro La Rosa, and I'm a freelance software architect for Mobile and Web platforms. I'm living in Rome, Italy. massimiliano on Android APN Italiani: manage your Italian mobile operator APNs with a click! 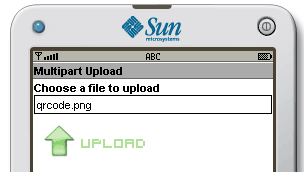 Today’s code is related to file uploads using J2ME. We’ll use Http POST MultiPart requests to handle and transfer data from J2ME application to server; since there is no builtin support for MultiPart, we’ll have to build the request body by hand. and then send data to server (and get response) with its send() method. As you can see from the constructor, this implementation support also parameter passing, that will be posted to server together with the file bytes. Detailed and explained code (with sample client and server code) is available here: HTTP Post multipart file upload with J2ME Wiki article. To directly download source code, click here. Hi! I have tried using the class in a MIDlet, but I cannot make it work. Can you help me? I’ve posted that on a forum, but I haven’t found any help yet. please help me to solve this problem ….